We know how stressful it can be when your product stops working, that’s why the Know how team at Trust Computers are on hand to help 6 days a week, whether you visit us in shop or call us. If your computer is no longer meeting your needs, crashing or freezing bring it to us and we will discuses the best upgrade options to suit your budget. PC Tune Ups will enhance your computer’s performance, and make sure you’re fully protected from security threats and viruses. We`ll collect your faulty computer/ Laptop, fix it and drop it off to your door. If you want to backup your files / data, we provide the solution. 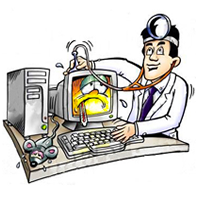 Data recovery service is available. Bring your consoles including Nintendo DS & PSPs for repair at your satisfaction. We can unlock all major brands of phones including Nokia, Motorola, Samsung, Sony Ericsson, Sharp, Sendo, LG, Siemens, iPhone, Toshiba and others. So whether you want your phone to use a different network simcard or you want to use it abroad, we can unlock your phone without invalidating the warranty in most cases. © 2019 Trust Computers All Rights Reserved.